In the early days of assisted reproductive technology (ART), treatments such as in vitro fertilization (IVF) were considered experimental and elective – those who could afford to pay for it could access the treatments, as it wasn’t part of ‘mainstream’ medicine. Now, as techniques have improved, ART accounts for nearly two percent of all births in the United States, with an estimated eight million babies born from IVF worldwide since the first successful IVF cycle in 1978. Over 30 percent of IVF cycles result in a live birth. Emma and Scott have dreamed of starting a family since they were married five years ago. They quickly discovered they weren’t able to conceive on their own, and fertility treatments were unsuccessful. Scott and Emma, now 38, have turned to IVF as the next option to try to have a child. Ovarian stimulation was successful, and the couple end up with six viable embryos ready to be implanted or frozen. Now, their doctor has asked them to consider whether they want to transfer one embryo, or more than one embryo in the first embryo transfer. The doctor explains the risks and benefits of single-embryo transfer vs. multiple-embryo transfer, including the risk of having a multiple gestation with multiple-embryo transfer, which then increases the risk of complications for both the mother and fetuses. However, the couple is concerned they may only be able to afford one round of IVF, which means this embryo transfer may be their only shot at achieving a pregnancy. Their insurance, like most insurance plans in the United States, doesn’t cover fertility treatments such as IVF, so they are left to pay for the treatment out of pocket. They wonder: Is it worth the medical risk to Emma and her pregnancy to transfer more than one embryo in the hopes that their chances of success on the first try may be higher? As technology advances and more Americans turn to IVF to conceive, many argue that fertility treatments should be considered part of standard medical treatment, subject to insurance coverage like any other medical intervention. 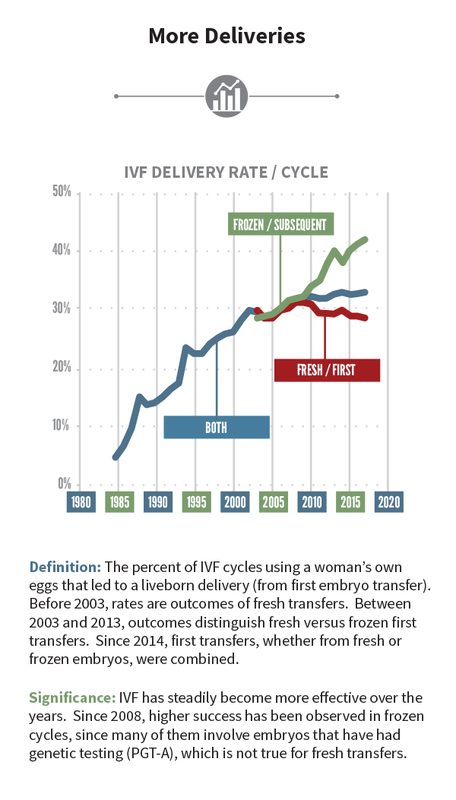 Without coverage, individuals are left to pay $12,000-$17,000 or more per cycle out of pocket, leading some to take bigger risks by transferring more than one embryo in the hopes that their chances of a live birth will be improved since they cannot afford to try this twice. Fertility clinics have proliferated in the setting of lax regulation and limited industry standards. Professional societies such as the American Society for Reproductive Medicine and the Society for Assisted Reproductive Technologies provide professional guidelines for various aspects of fertility medicine, including guidelines on the appropriate number of embryos to transfer in a given cycle. However, there are no binding protocols that place clear legal limits on fertility medicine. This opens the door to potentially risky practices outside the accepted norms of the field. Our recommendation-focused industry sharply contrasts with countries such as the U.K., where the Human Fertilisation and Embryology Authority has established standards governing fertility treatments. With little government regulation of practices, and no insurance company review specifying treatment options, U.S. patients who are paying out of pocket may find themselves making these ethically and medically difficult decisions. The fertility industry in the United States has long been referred to as the ‘Wild West’ of reproduction for its rapid expansion without strong oversight, causing such difficult cases as our hypothetical Emma and Scott’s embryo transfer decision, custody disputes involving sperm donors, and conflicts between intended parents and gestational surrogates over who is the legal parent of the resulting child. As the science continues to advance and the law continues to lag behind, it’s important to continue to ask the important question: how can we best protect patients while maximizing their chances for a positive and healthy outcome? Want to learn more about assisted reproductive technology, surrogacy contracts, and the changing face of parenthood? Register for the Baylor College of Medicine Center for Medical Ethics and Health Policy’s Conversation Series event, which takes place on Feb. 21 at 6:30 p.m.